Microsoft released Windows 8.1 with all the features I was missing from Windows 8 and added some new ones I know I will not be able to live without! As a Windows Champion, I will be testing and posting about the new Windows 8.1 so stay tuned! Windows 8.1 is to be extremely personalized towards the user, so you will feel right at home when you sit with your PC. It will have a customized start screen, different tile size selections and a wider variety of background colors and designs. This is perfect for me because I like the personalized and familiar. It makes me feel welcome! Since I spend SO MUCH time on my computer(s) I want to feel at home don’t you? However, when things change (like new operating systems) sometimes I don’t like the changes (aren’t we all a little resistant?) One of the big changes from the Windows 8 release was the disappearance of the Start button. I was not alone because soon the net was flooded with *hacks* on how to get it back. Microsoft listened! 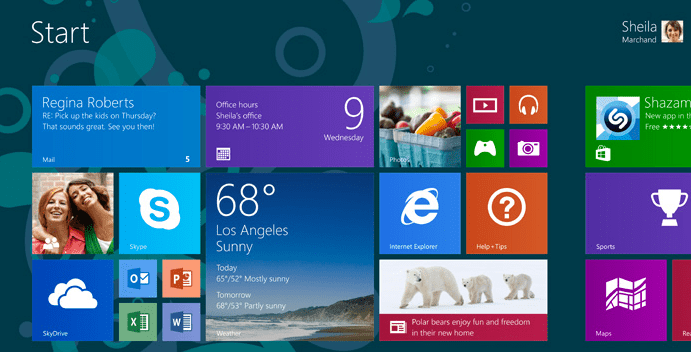 Windows 8.1 brought back “some familiarity” with the return of the start button. Now the simple way to navigate is back showing all of your apps at once for easy access. Whew! They took what I loved and made it better! Another addition is Bing Smart Search which helps you locate what you are looking for on your PC. It doesn’t matter if you are searching internally or out in the world wide web; you can search your apps, folders, documents and the internet from one place. WOW! Talk about efficiency! I cannot wait to try this feature. Anything that shaves off even seconds from my day is precious. Time is our most precious commodity is it not? You can also find updates on apps such as Bing Food & Drink and SkyDrive which you can now access from the Start screen. One more step removed now you can use your apps and services directly after login! I am a sucker for Productivity and multi-tasking. So also got a lot easier with snap screen. Don’t worry I will be posting all about that cool feature! Microsoft is such an awesome company, they are hosting a fun sweepstakes to celebrate the launch of Windows 8.1 It is SUPER EASY to do and the chances are awesome!! To celebrate the launch of Windows 8.1, the Windows team is running a Twitter contest from now until October 24th! Windows will pick 810 winners at random each day who shared their new Start screen after updating from Windows 8 to Windows 8.1. To enter, simply take a screenshot of your customized Windows 8.1 Start screen and share on Twitter with @Windows using the hashtag #MyStart. To take a screenshot of your Start screen in Windows 8.1, open up the Share charm from your Start screen and tap or click the down arrow next to “Start” and choose “Screenshot.” Alternatively, you can press the Windows logo key + PrtScn on your keyboard, or if you’re using a tablet, press the Windows logo button + the volume down button. Winners will receive a $10 promotional Windows Store gift card to get started with great Windows apps and games. See here for full terms and conditions.